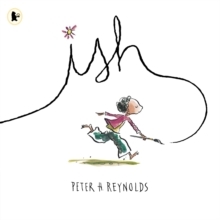 23 cm  p. : chiefly col. ill.
A creative spirit learns that a drawing doesn't have to look exactly like anything in this gentle fable from the creator of the award-winning, bestselling picture book The Dot. An inspiring, encouraging story for budding artists everywhere, the acclaimed illustrator of The Dot, Sky Colour and the Judy Moody series tells the story of Ramon, who loves to draw. Anytime. Anything. Anywhere. Drawing is what Ramon does. It's what makes him happy. But in one split second, all that changes. A single remark by Ramon's older brother, Leon, turns Ramon's carefree sketches into joyless struggles.